Product Brochure | SEZNEP INC.
CDR™ Pads The Complete Debris Removal Pad safely & effectively loosens dirt and debris by breaking up trapped in soils and lifting them from the surface. 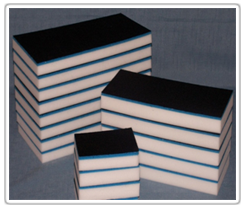 The CDR™ Pad is non-metallic, non-woven material which will not increase gloss levels. On aircraft surfaces where it has been extremely difficult to achieve results, the CDR™ Pad obtains superior results with minimal effort. 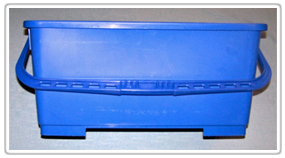 The CDR™ Pad features melamine, a soft blue replacement indicator and loop side of hook and loop that can be utilized with existing applicators. Approved by the US Air Force under T. O. 1-1-691, Page A-2 Table A-2, Item 39. Available in 3 sizes. Curved Applicator ~ This conformable cleaning head comes with a universal joint that easily attaches to our extension poles. For use with our LG CDR Pads and XL CDR Pads. universal joint that easily attaches to our extension poles. For use with our LG CDR Pads and XL CDR Pads. 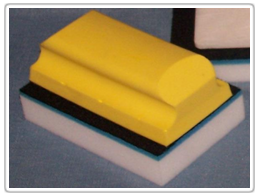 applicator is for use with the LG CDR Pads. Attaches with the hook and loop system. Small Hand Held Applicator~ This comfortable hand held applicator is for use with our SM CDR Pads. Attached with the hook and loop system. Telescopic Handle ~ Corrosion resistant anodized aluminum handles with nylon locking collars are built with the professional in mind. Length-wise grooves and comfortable plastic handles provides a firm, steady grip on this light weight. plastic handle pail. Easy to read measuring increments inside bucket assists with dilution mix ratio.